Have you had cauliflower “rice”? It’s a great low-carb or Paleo alternative to rice. Chop up a head of cauliflower florets and pulse a few times in the food processor until you get to a rice-like consistency. 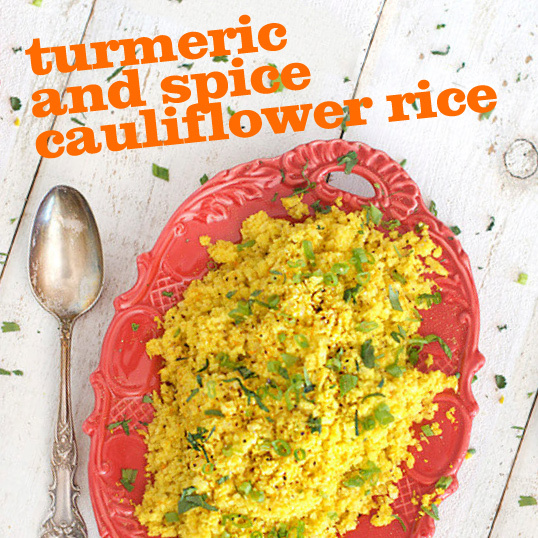 In this recipe by Laura at Family Spice, the cauliflower rice gets a delicious boost from fresh turmeric root and fragrant spices. Try it with colored cauliflower!